FOOTHILL RANCH, CA, June 5, 2018 – OleumTech, a leading global provider of M2M automation and Industrial Internet of Things (IIoT) solutions, today introduced the WIO® Radio Kit with Onboard I/O. As the name implies, the new product integrates both radio and a fixed set of analog and discrete I/O to its design, making it simple and very cost-effective to setup. The new Wireless I/O System (RM4) provides robust, secure wireless performance along with two analog 4-20 mA I/O and two discrete programmable I/O. The analog signals travel uni-directionally from Radio A (inputs) to Radio B (outputs), while the discrete I/O are bi-directional, set by its user. Just like all WIO System products, there is no software programming involved and it is extremely easy to setup and use, making it the ideal choice for common wireless signal replication applications and an alternative to hardwired solution in today’s market. By eliminating the cost associated with permitting, trenching, and running conduit and wire, the WIO System helps its users significantly reduce setup cost and installation time. “Customers benefit using OleumTech’s cost-effective plug and play solution. The WIO® Wireless I/O System, one of the most compact, robust, and easy to use, is based on our advanced RF and I/O architecture.” said Colin Lippincott, Vice President, Sales. “We wanted to give our users as much flexibility as possible. 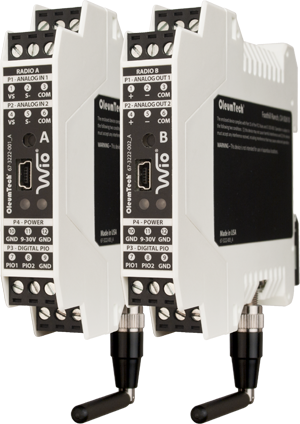 With the WIO Modular Wireless I/O System, you can build a customizable I/O stack and add a much higher I/O density. For common 4-20 mA and discrete I/O signal replication applications that involve only a handful of I/O points, the new WIO Wireless I/O System is hard to beat based on its feature set, ease of use, and price point. Though, OleumTech is best known by our products in the hazardous location space, the RM4 adds to the general purpose benefits that OleumTech has to offer in wireless I/O and automation. OleumTech Corporation is a leading manufacturer of industrial wireless automation solutions that represents the new paradigm of remote monitoring and control for industries such as Oil & Gas, Refining, Petro-Chemical, Utilities and Water/Wastewater. With over 400,000 transmitters and 40,000 networks deployed, the patented system eliminates costs associated with running cables and digging trenches with the use of its wireless tank monitoring, wellhead monitoring and peer-to-peer oilfield process automation solutions. Forming the foundation of a highly scalable, peer-to-peer wireless infrastructure, OleumTech Wireless Systems enables “last mile” connectivity in any wireless SCADA and telemetry application. For more information, visit www.oleumtech.com and follow us on Facebook, LinkedIn, Twitter and YouTube.